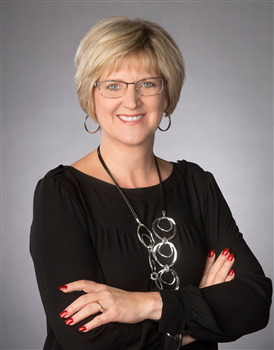 Jane Hay’s business success is a direct result of her can-do positive attitude, high energy work ethic, and long-term vision for a real estate business that incorporates both free home staging and excellent customer service. Jane’s diverse background in the fields of business operations, project management, and customer relations helped to mold her unique approach to traditional real estate sales. “When I entered the real estate business, I wanted to do something no one else was doing. I wanted to make sure my listings stood out in a way that got them sold quickly,” Jane recalls. “It’s not enough to put a sign in the yard, ad in the paper, and wait and see what happens. I wanted each and every one of my listings to be professionally prepared for sale so that the home would appeal to the most amount of buyers and generate the highest price in the least amount of time on the market.” Home staging has helped her do this. Prior to Jane’s real estate career, she served as a project assistant for the Secretary of State’s office and served on Illinois State Treasurer, Judy Baar Topinka’s executive staff. Jane also served as office administrator/paralegal for Wolter, Beeman, & Lynch Law Offices. Born and raised in nearby Taylorville, Illinois, Jane moved to Springfield in 1989. She and her husband, David made Chatham their home in 1998, where they now reside with their two sons. David works at Chatham-Glenwood High School where he is a teacher and Head Football Coach. Jane is devoted to making a difference and is an active presence in the community. "Jane, I marveled every day of the enthusiasm shown by you, from the time we signed a contract until the day of sale. The sincere interest you have in your client and selling homes is a rare quality. I consider my friendship with you, the best outcome of selling my house." Contact Jane Hay now and you will see the type of personal service and work ethic that will get the job done for you.